I’m participating in a new blogging event called Fill the Cookie Jar. It’s a monthly blogging event of home bakers who get together and share their favorite cookie recipes based on an assigned theme. Cynthia over at Feeding Big hosts the event. The theme for November is Thanksgiving/Fall and we could create either cookies or bars within that theme. I hate when you make a pumpkin recipe and it doesn’t use up the whole can. Then you’re left to find a recipe that uses up the remainder without opening another can or create an endless cycle of half open cans of pumpkin. Which is how this recipe came about. I had a half cup of pumpkin left over and I decided to play baker and see if I could create a cookie recipe using up the rest. Sugar cookies are perfect for the fall season when pumpkin is added. 1. In the bowl of your stand mixer, combine butter and 1 ½ cups of sugar and beat on medium speed until light and fluffy, about 5 minutes. 2. Add the egg and vanilla and mix until combined, then add in the pumpkin puree. .
3. In a medium bowl, whisk together the flour, baking powder, cinnamon and salt. 4. Slowly add the flour mixture into the mixer on low speed until combined and dough is formed. 5. urn out dough onto a piece of parchment or wax paper, roll up and refrigerate for at least 20 minutes but up to overnight. 6. Preheat the oven to 350 degrees and line two large baking sheets with parchment paper. Fill a small bowl with ½ cup sugar. 7. Remove the dough from the fridge and scoop out 1-inch balls of dough. Roll the dough in the bowl of sugar until coated. Place on the prepared baking sheet and press down lightly to flatten the dough. 9. Bake for 5 minutes, then rotate the pan and bake for another 5 minutes. Cookies will be just barely golden and still a little soft in the center. Remove from the oven and allow to cool on the pan for 2 minutes before transferring to a cooling rack to finish cooling. 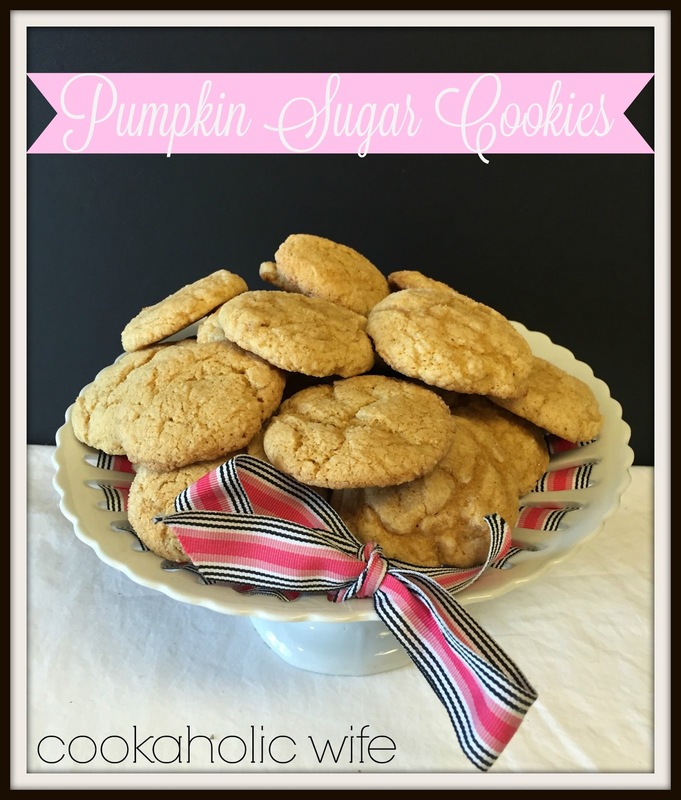 Soft and chewy, these cookies have just the right amount of sweetness and a hint of pumpkin that makes them perfect for fall! These look so perfect for the season! Love the simple spicing. I love soft cookies like these. Perfect for fall! Yes! Finally a recipe to use that last bit of the can of pumpkin! And, they sound fantastic!! Sounds yummy..perfect choice for Thanksgiving! These look amazing!!! I made sugar cookies, too, but didn't add pumpkin! Now I need to make sugar cookies again!! I much prefer chewy cookies and I'm a huge fan of pumpkin flavor. These sound heavenly. Fantastic way to use up the rest of the pumpkin! Great recipe Nichole. Necessity is the mother of invention. So many pumpkin recipes! YUM! Your cookies look delicious. I am with you, I hate it when you have 1/2 can of pumpkin (or anything) leftover. I will have to remember this recipe so I can use my pumpkin up. I hate to waste. 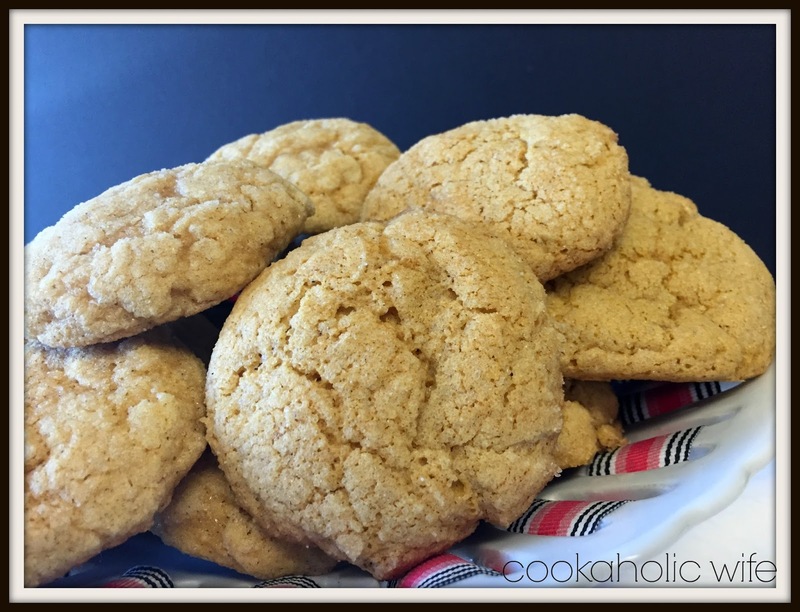 I am so glad you are a part of the Fill The Cookie Jar group! See you next month.